When Reporting From An African 'Village' Is Imperial Arrogance – And Not : NPR Public Editor NPR has been covering the recent conflict in Mali from on the ground. But when a listener heard several places being called "villages," she asked why the images of primitiveness. NPR's West Africa correspondent answered. 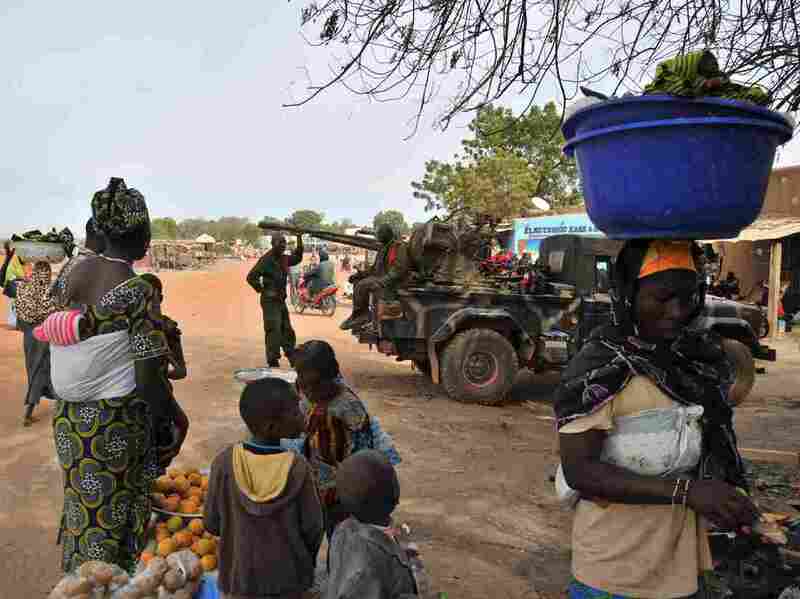 Malian soldiers patrol in Diabaly, Mali on Jan. 22, 2013. Dialaby was one of the places referred to as a "village" on NPR. Some listeners rightfully have sensitive cultural antenna for reports from developing nations that smack of offensive exoticism from the heart of darkness. But one person's offense is another person's reality. This was nowhere more true than in an insightful exchange over the seemingly innocuous labeling of a "village" versus a "town." I was struck this morning by the use of the word village referring to the places in Mali that are under attack by rebels. I realized that in the U.S. we would call a small place a town and that the use of the word "village" connotes primitive, tribal, when in Africa, but sounds quaint when referring to a locale within a New England town, etc. I acknowledge that my use of village, town or city is not scientific and I often won't have the chance to check a population census before reporting, so I tend to go by how residents refer to their place of abode. If it's a metropolis, I'll call it a city or major/main city or centre of capital city. If it's clearly a large town, but smaller than a city, then I'll say just that — large town or main town. If I see a village, I say a village — and it won't necessarily be rural. There are sometimes urban villages on the fringes of towns and cities. Taking your specific query: "use of the word "village" connotes primitive, tribal, when in Africa". I see your point, it can be tricky and it's all about interpretation and, of course, a reporter — certainly this reporter — never wants deliberately to cause offence. But I'm an African myself and don't have cultural hang-ups about this matter — a village is a village, a town a town and a city a city! Hope that clarifies matters; if not happy to continue the exchange. Quist-Arcton represents a trend in which mainstream United States media hires local reporters. It is part of a globalization of news standards and English. They offer the added bonus of local cultural insight and sensitivity, which may be different from our own. Intern Kiran Alvi contributed to this post.